When my mother was a girl, in Manitoba, an old Red River cart sat on the river bank not far from the Adolph farmhouse. Her grandparents and their children had traveled in it from North Dakota to the Canadian frontier. Their journey began years before along the Volga River in Russia. They traveled by train across Europe, by boat to England, then by steamship across the Atlantic. Once in the United States, they went west by rail as far as possible, then transferred to stage coach. Most family members were content to stay in Montana. Not Great-Grandfather.. Dissatisfied with both Montana and North Dakota, he packed up his family, whistled to the dog, took the reins and said "Giddyap!" I'll bet he didn't even consult Great-Grandma who by then was probably heartily tired of traveling. She must have been so pleased to finally settle near Lydiatt. Recently I thought of Great-Grandmother on her trip through the West; little children crowded into the wagon, bigger ones walking beside it, dust in their eyes; oxen straining in harness, pots and pans clanging, quilts rolled and hanging from the cross pieces, potatoes and onions rolling about. All that she needed to feed, clothe and doctor her family was under that canvas cover. How do I travel? Let me count the ways. Like Great-Grandma, I take food, of course, and medicine. Sun screen. First aid lotion, in case the sun gets through. She hoped for streams along the way. I carry bottled water. They had few clothes, most of them dark wool. I tote a suitcase stuffed with attire suitable for a day at the beach, an evening round the campfire, plus a few 'good' clothes in case I'm invited to the mayor's reception or a Royal garden party. Can't be too well prepared. There's a cotton shirt to keep out the sun and a warm jacket to ward off the night chill. Day pack, binoculars, lawn chair, camera, cooler, toiletries, water bottle. I began wrestling the unwieldy mound into the car with admiring thoughts of Great-Grandma. The mountain of gear is even worse when camping. 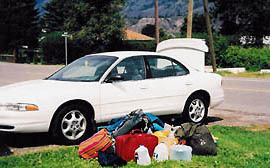 Car camping requires a full array of lanterns , food boxes, tarps, chairs, stoves, water buckets, sleeping bags, air mattresses, tents, wash basins, dish towels, clothes lines and fire starters that would have driven Great-Grandma to desert the wagon train at Minot. To add to the problem, items occupy a space far beyond their own physical boundaries. Some of them, the dashing, adventurous ones, hide. They form friendships with similar minded matches or bottles of dish soap, crawl under a cracker box and are never found again until you unpack at home. By this time you've purchased replacements . And they're all secretly laughing at you. Those early travelers had no such problems. They were skilled in the art of simplicity. For one thing there just wasn't much room. Any treasures which made it to North America from the 'Old 'Country' are therefore, doubly dear. They took only practical necessities. Food, clothing, cooking and sewing utensils for the women. Axes, saws, hammers, harness mending tools for the men. In 1849 Catherine Haun and her family traveled by wagon train from Clinton, Iowa to Sacramento, California. Catherine recorded their journey in her diary. A stout trunk held the clothing ,she writes, and, "In the trunk were also a few treasures; a bible, medicines such as quinine, bluemass, opium, whiskey,, and hartshorn for snake bites, and citric acid for scurvy. Our matches, in a large-mouthed bottle, were carefully guarded in this trunk." "The pockets of the canvas walls of the wagon held every-day needs and toilet articles , as well as small fire-arms", she continues. "The ready shotgun was suspended from the hickory bows of the wagon camp. A ball of twine, and awl and buckskin strings for mending harness, shoes, etc. were invaluable.
" Self-contained travel at its best. Back-packing, you'd think, would be the modern equivalent to those pared down wagon trains, reducing the load it its simplest, most essential parts. Well, experienced back-packers would prove you right, especially the grim, dedicated ones who drill holes in their toothbrush handles to make them lighter. I've never gone to such extremes, myself, but I have resolutely re-packaged every instant soup and noodle meal I took hiking . 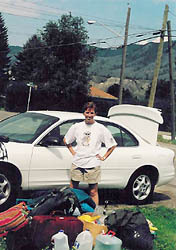 However, not all pioneers or back-packers started their travels lightly loaded. Told to take just the necessities , early emigrants to the California gold fields stowed in the wagons, furniture they thought was the minimum for a civilized life. As the weary miles wore on and oxen died, these cherished items were jettisoned. Even today shifting Nevada winds move the sand, revealing abandoned pianos and cupboards, traces of the optimistic travelers of 150 years ago. 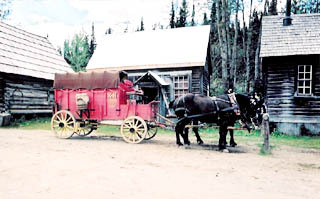 Catherine Haun's wagon train leaders, "..sized up each party?.Such luxuries as rocking chairs, wash-stands and corner what-nots were generally frowned upon and when their owners insisted upon carrying them they had to be abandoned before long on the roadside." I don't know if Great-Grandma left the Lower 48 in similar fine style. If so, her attitude certainly was transmitted to her descendants., particularly my younger brother who, on our first family back-pack into Berg Lake at the foot of Mt. Robson, carried an entire cutlery set for eight. When we asked why, in amazement, he muttered he thought it might come in handy in case someone forgot a spoon or fork. Besides, eating with flatware seemed the proper way. struggle between what we want and what we can carry. And the Red River cart? It stayed on the farm, its boards cracked with sun, its canvas gradually fraying, blending gently into the prairie landscape until the April day when my youngest aunt, in a frenzy of spring cleaning burned it as a "useless old thing"
That was fifty years ago. Most of the family are speaking to her again.